Discuss "Clementine" by Sonia Purnell, August 15, 2018 6:30 p.m. When: Wednesday, August 15, 2018, 6:30 p.m.
Late in life, Winston Churchill claimed that victory in the Second World War would have been “impossible” without the woman who stood by his side for fifty-seven turbulent years. Why, then, do we know so little about her? In this landmark biography, a finalist for the Plutarch prize, Sonia Purnell finally gives Clementine Churchill her due. Born into impecunious aristocracy, the young Clementine Hozier was the target of cruel snobbery. Many wondered why Winston married her, when the prime minister’s daughter was desperate for his attention. Yet their marriage proved to be an exceptional partnership. "You know,"Winston confided to FDR, "I tell Clemmie everything." Through the ups and downs of his tumultuous career, in the tense days when he stood against Chamberlain and the many months when he helped inspire his fellow countrymen and women to keep strong and carry on, Clementine made her husband’s career her mission, at the expense of her family, her health and, fatefully, of her children. Any real consideration of Winston Churchill is incomplete without an understanding of their relationship. 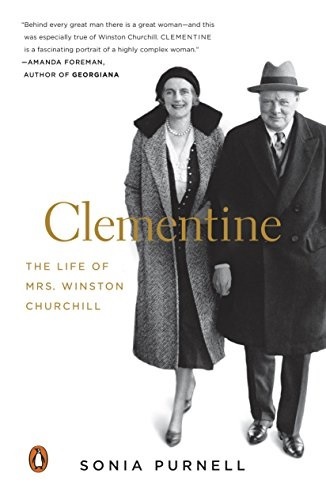 Clementine is both the first real biography of this remarkable woman and a fascinating look inside their private world.